If you love music, nothing can seem better than building a career in music by becoming a DJ. With the right equipment, attitude and insurance, you can become a successful DJ quickly. 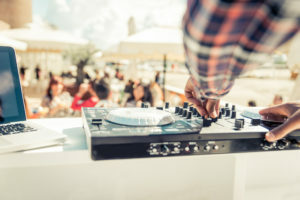 DJ equipment: Although you could spend many thousands of dollars on this, you can get a basic DJ mixer deck, a CDJ and speakers for a few thousand dollars, often between $3,000 and $7,000. A van or other vehicle to drive all your equipment to each event. Music: You need to legally own every piece of music you play, whether it’s a CD, vinyl record or a downloaded track. Get music from across a range of genres and eras, as well as the most popular new hits. Licenses: Depending on your state or municipality, you might need to get a business license to work as a DJ. You shouldn’t need to buy a license for the music you play – the owner of the venue is responsible for that. DJ insurance: Most cities require every business to have liability insurance, and you might want to get other insurance too. Standard contracts: It’s a good idea to sign a contract for every gig or event. You can buy contract templates online or at an office supplies store. Marketing such as poster, flyers, ads in your local newspaper or a stand at a wedding or event fair. You should also make sure that you’re listed in your local business directory so that people know that you’re available. DJ insurance also shows your clients that you are a responsible and reliable business owner. It encourages venue owners and clients to work with you because they see that you take your job seriously. Back up your music. You don’t realize how much your MP3s are worth until they all get wiped off your hard drive and you have to buy each one again. At weddings, remember that the bride and groom are relying on you to make their day. Ask about their music preferences and the order of the wedding beforehand, and give it your all when you begin.